Interesting but I have to be honest, when I cook, I don’t give things like these much thought, I’m so terrible! That’s why I’m here. To be that subconscious voice. Duh-duh-duh-duh (that’s deep music, eery-like if you can’t tell). Some voice whispering, faintly, almost unheard across the large, billowing ocean, “Do you know what function that food plays in your family’s health? Do you?” Okay. I’m laughing. I never gave it thought either, beyond calcium, how much fat, and did we eat any vegetables! But I do now, and I love to look at traditional, cultural foods with this new point of view. Somehow, they knew what to eat usually. We’re losing that in our modern culture. I always think of those eggs you posted on your blog! You take care and be safe! All I know is if we eat vegetables, we’re good LOL Thanks Terri! Lucky, duckies! Ah, well. We all have our thorns…LOL! You are beyond welcome! Thank you for commenting! I learned so much, and I know I only skimmed the top! I actually do have close relatives who are pigs and rats (at least they act like it). Any suggestions for increasing the amount of butyrate in the gut (the non-medical term)? I am not a fan of either beans or potatoes! I hope to get to that, but nobody should wait around on me! Doctors are notoriously late! I’m going to keep looking and looking because I don’t quite have it figured out yet. Mmmm. No potatoes. Probably no corn? Sweet potatoes and yams are good, but especially if you cook them and then eat them cold. That would be best. Really. Make a salad out of them or something. Green bananas? Lentils? If you’re really low carbing, it gets tougher. One option, I think is to include an FOS like inulin. But I have to figure that out for sure because I’m not sure if the bacteria use that to make butyrate or if it only increases the butyrate producing bacteria. I’ll keep reading. Good question. It is important to know. I will hopefully clarify things soon as I clarify them in my own head. For now I can give a generic sentence. When certain starch foods heat (like potatoes and sweet potatoes), their starches become gelatinized. As they cool, their physical structure (think physical rather than chemical) changes to a “retrograded starch” which the small bowel cannot digest. Very interesting. I can’t wait to learn, summarize, and share more. What about making your own flour; with a food dehydrator, take some green bananas, once they become “chips”, throw them in a bender(vita mix) and you have green banana flour. Yes, that would be great. One day, I’ll do that when my kids are older and I have a little more time. For now, I’ve taken to tossing them in a freezer bag. What ways do you use your green banana flour? Since heavy whipping cream is basically un-whipped butter, does it contain butyrate, or is it an additive? The reason I ask is that pre-lowcarb I didn’t touch butter or real cream, margarine and flavored non dairy creamers only, I had bad issues with constipation. Since opting for the real cream and butter, I don’t remember the last time I’ve had that problem. (I don’t eat lentils, corn, or white potatoes, maybe once a month a bit of sweet potato). Thank you. Are you ready for a book? Get ready: The butyrate in butter is natural and would be in cream, too. It is not an additive. You may know about this topic already, but I have read that one of the “Inuit explorers” back in the 1800s and had constipation on his typical diet. When living with the Inuits and while eating a meat-based diet only, his constipation issues resolved. I’m sorry. I cannot re-find that link now with that specific statement. I VERY quickly found a link about these explorers for you because I find it so interesting–forgive me if it’s old news for you–perhaps it may interest someone else who reads comments: http://inhumanexperiment.blogspot.com/2009/09/two-brave-men-who-ate-nothing-but-meat.html . I know nothing about this blog so I’m not vouching for anything other than the depiction of the story. Your story maybe could mirror his. The GI tract is so multi-affected it could be removal of food sensitivies, addition of fats; most would argue that butter/cream does not have enough butyrate that makes it to the colon to make a difference. I don’t know. Maybe it could. Doesn’t sound like this explorer would get much butyrate to help his slow gut…I also have read of some people swearing by high fat dairy for slow GI. (Made my afflicted family much worse.) Fermented foods may have some butyrate, too. I will be definitely looking into this. I love kraut! Sorry your kombucha died! Ugh! On leaky gut, I’m pretty sure my gut allows too much to get through. I hope to get to that topic sometime. It’ huge for me. The body is amazing and when you throw bacteria playing a role in physiology, well, it’s simply magnificent! We each have our own bacterial flora, and I believe that’s part of why we can never prescribe “one diet fits all.” With high regards. I have not read that, but am reading it now. Looking forward to learning more. Thank you so much! I had to reply again. That was a most excellent read. Thank you again. You are welcome. I agree that it is excellent to read about. You can Google the explorers names and find out even more. I think you can even find some original text from way back online. I thought it was! Looking forward to sharing more. 1) Do human intestinal bacteria really have the ability to create significant quantities of butyrate? I had always believed that humans have lost about 80% of their long intestine through evolution. Gorillas to contrast get large amounts of calories from short chain acids, because they both eat massive quantities of fiber and also have much longer long intestines. 2) Can humans really get much butyrate from dairy? At only 3% to 4% of calories in goat cheese coming from butyrate, is that really significant? 3) How much butyrate is enough? Of course this makes is all the more difficult because not only do we not have an easy way to produce very much butyrate, but it’s not clear how much we would get benefit from in any case. 4) Isn’t butyrate very similar in terms of metabolism to MCT Oil, which is a medium chained fatty acid derived from Lauric acid in coconuts? Both of these go right to the liver and create ketones. But, unlike butyrate, you can buy concentrated MCT Oil and deliver significant metabolic quantities into your diet by sprinkling some on every meal. Personally, MCT Oil raises my metabolism a little too much. I’m still not sure what the right level is. 1) We have the ability to create significant quantities of butyrate for our own physiological effects if our diet is correct, but we wouldn’t need as much as the gorilla, I assume. We do not use the butyrate as a source of fat/macronutrient, like I understood may be the case with gorillas. We use it as fuel simply for our colonocytes and then to modulate some other pathways in the body. But we don’t need them for fuel. 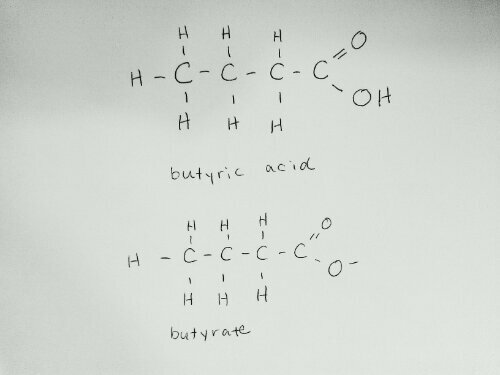 4) Their absorption is similar, but I think that butyrate is not primarily used to make ketones. (Until you asked this question, I didn’t think SCFA/butyrate were made into ketones. But this shows they can be, I just don’t know how much.http://pathman.smpdb.ca/pathways/SMP00073/pathway?level=2) Most are absorbed and used by the colon cells. The fate of those molecules that make it to the liver I have not found much information on. I would really like to. But for myself, I am using butyrate for the colon effects, rather the ketone production. Otherwise, I’d go for the MCT Oil (or coconut oil). I have never used MCT Oil. I have used coconut oil. I really like it a lot for a few reasons, but it after using it awhile, I developed headaches with it. Pingback: 10 Safe Unhealthy Foods– Say What?? | Talk 'N Share – Healthy Eating = Good Health! Interesting. I just ran across this article after searching for info on butter and butyrate. I was trying to figure out why my digestion and inflammation seems to have disappeared overnight. The only thing I can think of is the Cal mag butyrate pills I took at lunch yesterday. Come to think of it, I do better when I eat lots of ghee. Perhaps I should go back on the potato starch! That’s interesting. Would be neat to figure out who and why they respond to butyrate. Like most anything, it’s not always good for all people, it might seem! The direct butyrate may provide different results over the potato starch, as bacteria adapt and produce while on potato starch. I like to try to incorporate traditional resistant starch foods into our menus at home: cassava root (leftovers), green banana, reheated potatoes, beans, etc. really great blog. you should read the The Prophets Medicine by Ibn Quayyim. also see the google + group tibbe nabawi Healing by Islam. My journey started with Black seed oil..; I am off all my meds 11 of them for severe GERD/barrets esophagus, depression, anxiety, severe seasonal allergies and asthma. My son is no longer allergic to our dog. One thing is to eat sweet potatoes and ghee. but as physician it might interest you. I am a nurse and learning about that medicine and Unani. The western world has gotten so dependant on pills to cure them and leaving the what the earth offers behind. thanks for your research and your energy. Thanks, Joan. I’m glad you’re feeling so much better. You gave me a few things to check out. You use the words “leaving what the earth offers behind.” Those struck me. I myself am trying to reclaim an appreciation for all that God has given to us on earth. I know I had lost it. Hi, Mili. Pardon my delayed response. Sorry. I think turmeric is a great food/spice. What exactly did you mean when you asked, “Would this tie in with eating sweet potatoes and ghee?” As in, does it help with butyrate? Or more like, is it a powerful contributor of good things for health? Hi, Mister T. I don’t use butyrate regularly now, just occasionally if things are at their worst, which thankfully is not very often anymore. I tried several brands. The two brands I used were BodyBio cal-mag and EliE Butycaps. Whenever anyone asks what I use, I always reduntantly remind then that what works for me may not work for them and also that their health condition may be such that butyrate is not appropriate for them or their body. I also do not endorse any company or get any money off of my blogging activities. It’s just my anecdotal experience along with researching and documenting what I read. Warmest wishes for good, all-around health.